Working on an archive involves a fair share of sleuthing, and a memory for detail certainly doesn’t hurt. In the course of sorting through boxes of material, you come across photographs and other items with no explanatory information. Based on clues in the image—clothing, buildings, equipment paint schemes—you can usually narrow down when and where the scene took place. Other times, you can’t seem to fill in any of the blanks, and the item goes into a “mystery” pile to be later revisited. Note the bird decorations above the windows and on the back wall. I uploaded this postcard a few months ago, and although it was obvious that it showed a Dining car, I wasn’t sure of the car’s origins. In preparation for the start of service in May, 1971, Amtrak handpicked approximately 1,200 cars from a total pool of 3,000 held by the 20 railroads that had been relieved of their passenger service obligations. Almost 90 percent of the chosen cars were either constructed of, or sheathed in, stainless steel, which meant lower maintenance costs. Mechanical and electrical overhauls were needed on roughly a third of the fleet, as were refurbishments to the interiors. In addition to coaches, Lounges and other car types, the purchase included 140 Dining cars of differing configurations. I was recently working on material for National Train Day, celebrated on May 10 at locations across the country, and came across a reference to the Southern Pacific Railroad’s streamlined Sunset Limited (New Orleans-Los Angeles), which included a Dining car embellished with images of birds. The mention of the birds rang a bell, and I remembered this postcard. My hunch that it showed one of these Dining cars was confirmed by searching through images and articles online. The Southern Pacific (SP) launched the new, extra-fare Sunset Limited in August, 1950. It used five stainless steel passenger train sets manufactured by the Budd Company at its plant in northeastern Philadelphia. In addition to a Baggage-Postal car, Baggage-Dormitory car, divided Chair car, three passenger Chair cars and six 10-6 Sleepers, each train also carried a “Pride of Texas” Coffee-Shop-Lounge car, a “French Quarter” Lounge car and an “Audubon” Dining car. china is on the table. The bright and fun décor, coordinated by Philadelphia-based architect John Harbeson, was clearly inspired by the cities and regions through which the train ran. In addition to his architectural practice, teaching and writing, Harbeson worked with the Budd Company on designs for various streamlined trains from the 1930s onward. His vision for the Coffee-Shop-Lounge car included longhorn steer heads, spurs and a bar decorated with cattle brand marks, while the Lounge featured cast-iron trellises in reference to New Orleans’ French Quarter architecture. 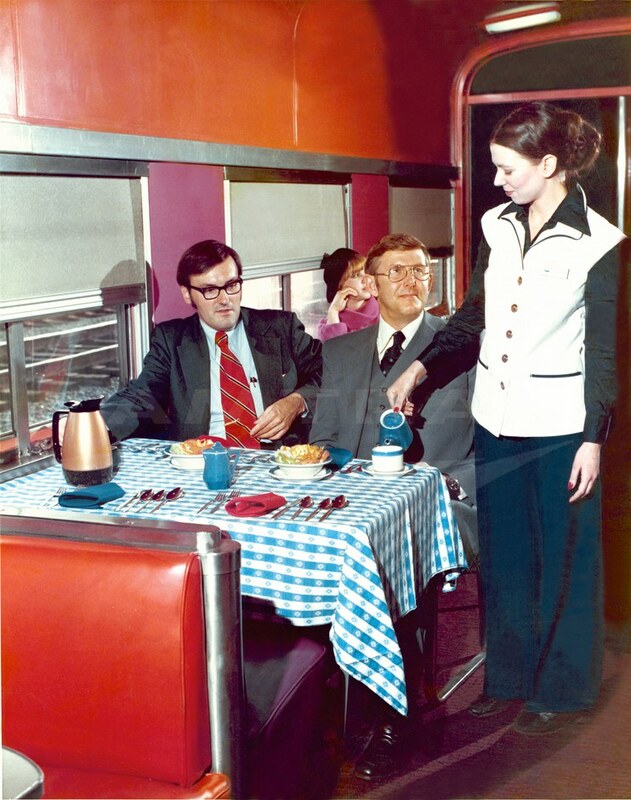 A contemporary article in Railway Age magazine described the 48-seat Audubon Dining car as “decorated in soft tones of Bayou green, turquoise and Gulf blue, with hand-painted reproductions of bird illustrations by the famous artist and naturalist, John James Audubon…the background of the ceiling is turquoise with a diagonal lattice of the green superimposed to form an arbored effect.” The drapes had a bird-of-paradise motif, and even the blinds were turquoise and green. It’s not clear what year the image on the postcard was taken, although it was likely in the early 1970s. Comparing it to older photos of the car during its SP days, not much had changed under Amtrak, except perhaps for the use of the blue Amtrak china—which happened to fit in perfectly with Harbeson’s color palette.